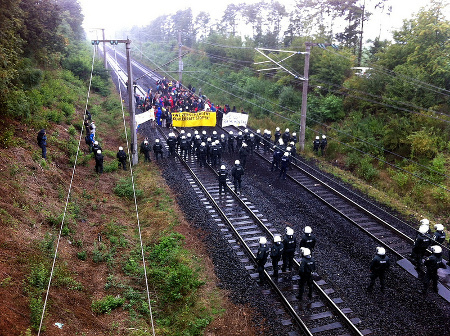 Yesterday, Oct. 15th, RWE’s opencast mines and power plants went on strike. It is unclear whether the semi-wild strike was planned in this way (as the union formally declares, so as not to be prosecuted for directing an unannounced assembly), or if the blockade of factory entrances and access roads was spontaneous. Unfortunately, the pickets had no stamina, so at 11:00 am they left the field to the Marximal Confusion action group, although their vigil was announced to last until 2:00 pm.